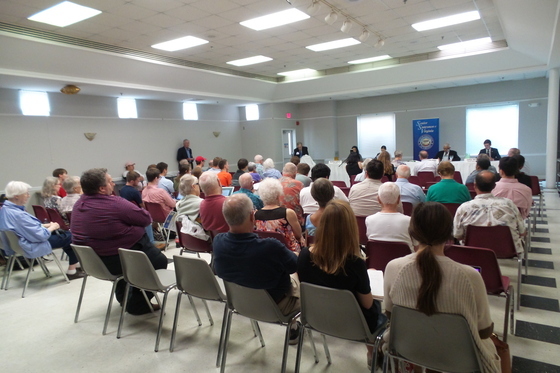 Candidates for contested Albemarle County Board of Supervisors and School Board seats shared their views and responded to questions from the audience at this Senior Statesmen of Virginia sponsored forum. Candidates speaking at the Senior Center in Charlottesville. The following candidate information is excerpted from the candidates’ campaign websites. John Lowry (R) lives in North Garden. His background is in financial management. He is also a former chair of the Albemarle County Economic Development Authority. John is a runner and a member of the Albemarle Pipes and Drums Corps. Liz Palmer (D), the incumbent supervisor seeking a second term, lives in Ivy. She is a graduate of Virginia Tech and the Auburn University Veterinary School. She served as chair of the Board in 2016. She operates a veterinary hospice for companion animals. Katrina Callsen is a graduate of Yale, the Boston University School of Education and U.Va. Law. She is a former teacher with Teach for America. She volunteers with Kids Give Back. Mary McIntyre is an alumna of UNC — Greensboro who holds master’s degrees from the University of Michigan and the University of Hawaii — Manoa. She has taught in North Carolina, Virginia and Hawaii and volunteered at a school in Tanzania. Graham Paige, the incumbent seeking his first full term, resides in Esmont. He is a graduate of Hampton University with a master’s degree from the University of Virginia. He is a retired Albemarle County teacher. He is a trustee, adult Sunday-School teacher and organist at New Green Mountain Baptist Church. Julian Waters is a 2017 graduate of Western Albemarle making his first run for elective office. He is active in education-policy issues and a regular blood donor who founded the Model Aviations and Drone Club at Western Albemarle. The event took place at the Wednesday October 11, 2017 meeting of the Senior Statesmen of Virginia. The meeting was held at the Senior Center in Charlottesville. Following the presentation, questions were taken from the audience. SSV Board Member Terry Cooper moderated the Board of Supervisors forum. SSV Vice President Rich DeMong moderated the School Board forum. Liz Palmer and Tim Keller speaking at the Senior Center in Charlottesville. We all appreciate the amenities, cultural and historical richness of our community but those are the very things that attract others. Growth often increases road congestion, noise and property taxes. Can we avoid the tragedy of the commons? Liz Palmer, Chair of the Albemarle County Board of Supervisors and Tim Keller, Chair of the Albemarle County Planning Commission address these questions in this podcast. Liz Palmer is the chair of the Albemarle County Board of Supervisors and represents the Samuel Miller District. She was elected in 2013. Prior local government service includes eight years on the board of the Albemarle County Service Authority. She has been a practicing veterinarian for 35 years. She currently operates a mobile practice, Charlottesville End of Life Pet Care. Tim Keller serves as the at-large commissioner and chair of the Albemarle County Planning Commission. He is a founding principal of Land and Community Associates and professor emeritus of Landscape Architecture at Iowa State University. Tim has directed a variety of innovative landscape planning and conservation projects throughout the United States and abroad. Palmer and Keller spoke at the Monday October 17, 2016 meeting of the Senior Statesmen of Virginia. The meeting was held at the Senior Center in Charlottesville. Following the presentation, questions were taken from the audience. The program was moderated by SSV past president Bob McGrath. Hawes Spencer, founder and editor of The Hook, has won statewide journalism awards for his reporting on Central Virginia’s water supply debate and he joins Coy Barefoot on Charlottesville Right Now. Albemarle County Service Authority Board Member and advocate of the existing water supply plan, Liz Palmer, joins Coy in studio to discuss the latest in the local water debate.